Traversing the rich Star Trek universe, the debut collection of Waypoint stories feature captivating standalone tales drawing from five decades’ worth of history. These thought-provoking stories range from “fill-in-the-gap” tales that weave into previous events as well as pushing the stories forward into fresh territory never before explored. Hailed as “the best of Star Trek in bite-sized stories” by Multiversity, Waypoint presents bold new takes on your favorite Star Trek characters! 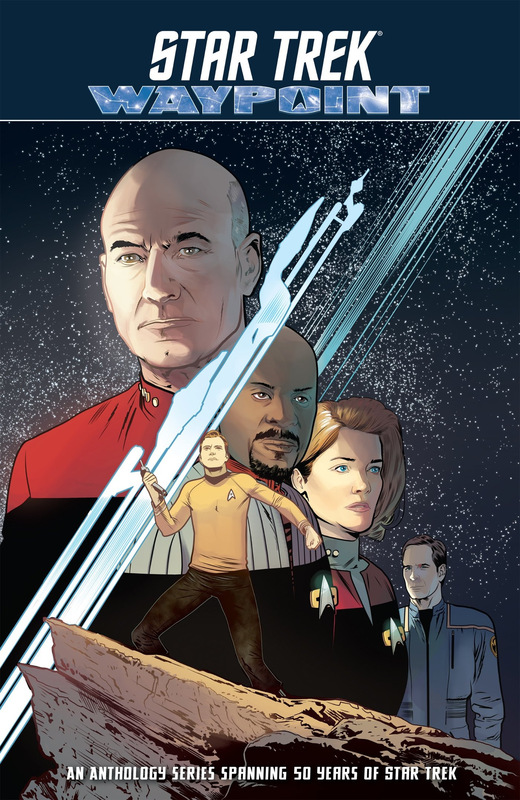 Star Trek: Waypoint features crews and characters from Star Trek: The Original Series, Star Trek: The Next Generation, Star Trek: Voyager, Star Trek: Deep Space Nine, Star Trek: Enterprise, and more, in exciting stories envisioned by top-tier talent. Creators putting their unique spin on the beloved franchise include Donny Cates (Dr. Strange), Gabriel Hardman (Green Lantern: Earth One), Cecil Castellucci (Shade, the Changing Girl), Sam Maggs (Secret Loves of Geek Girls), Mack Chater (Black Panther and The Crew), Megan Levens (Star Trek: Boldly Go), Cavan Scott (Star Wars Adventures), Rachel Stott (Star Trek/Planet of the Apes), Josh Hood (We Can Never Go Home), Simon Roy (Prophet), Mairghread Scott (Transformers), Corin Howell(Ghostbusters), Vivek J. Tiwary (The Fifth Beatle), and many more! The 6-issue collection will feature an all-new cover by Josh Hood.